Ever wonder what exactly leads to the changes we see in our faces as we age? Although sun damage has a strong impact on the skin surface quality, there’s a lot more going on over the decades which leads to many of the concerns that bring clients into Renew MediSpa looking to hit the refresh button. Achieving a more youthful look is certainly possible with attention to skin quality and skin tightening, but when you add full, natural volume restoration the results can be dramatic. So, if we want to combat this “sink and sag,” what do we do? The simple answer is volume restoration. We have many services at Renew MediSpa which address the loss of collagen and elasticity in the skin itself. One of our most popular and long-lasting filler options is Sculptra®. As we age, bone resorption leads to some subtle changes like a widening of the orbital rims (the bony around the eye), a change in the angle of the nose and reduction in the support underneath the mouth and jaw region. 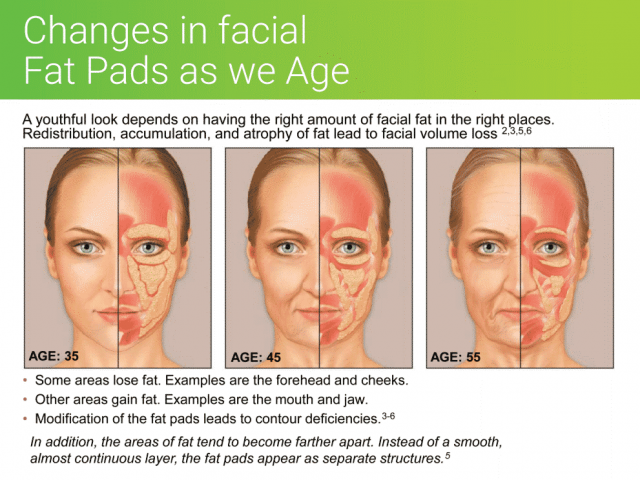 Equally important are changes in the facial fat pads as illustrated below. As we age, bone resorption leads to subtle changes like a widening of the orbital rims (the bony area around the eye), a change in the angle of the nose, and reduction in the support underneath the mouth and jaw. Equally important are changes in the facial fat pads as illustrated below. We can smooth and tighten the skin, we can even lift it to some degree non-surgically, but these efforts do not take the place of lost volume. Traditional hyaluronic acid dermal fillers (ex: Restylane®, Belotero, and Juvéderm®) have become more and more sophisticated over the years, and in certain areas of the face they are indeed the best choice; these areas include the lips, the peri-oral region, and the tear trough region under the eye. Although larger areas of volume loss like the temples, midface, cheeks, and the jawline can be treated with the same fillers mentioned above, multiple syringes of products are necessary to restore what has been lost fully. For example, a 50-year-old patient could easily require 1.5 syringes for the temple region, two syringes for the cheeks, and another two for the lower face. Keeping up with a five-to-six syringe correction of filler, two to three times a year, can become quite costly. Sculptra® provides a sensible solution to the issue of maintaining your desired results in the long term. The effects of Sculptra® injections can last for many years, providing visible and youthful-looking fullness to the face, temples, jawline, and even the décolletage. Sculptra® because it works with your body to help revitalize the production of collagen, the natural substance that gives your skin resiliency, elasticity, and shape. Sculptra® adds volume to areas of the face to create a soft, natural, youthful recontouring of the face. Your rejuvenated, youthful appearance can last up to two years. Treatment works subtly and gradually over time. Unlike hyaluronic acid (HA) fillers, Sculptra® helps stimulate your skin’s natural collagen production to help restore its inner structure and increase the facial volume that has been lost to aging. It is also used in other areas such as the decolletage, the buttocks, and the arms in areas where improved volume and/or skin thickness are desired. Is Sculptra® Better than Other Injectables? There is no such thing as a “best filler.” Deciding which to use depends on consideration of many variables including: the type of correction needed, the specific area to be treated, the depth of injection planned, the physical properties of the various injectable products, the total amount of volume loss in the areas to be treated, and the thickness of the skin in the region. A face-to-face consultation with treatment planning is the best way to determine what will achieve your personal goals for facial rejuvenation. And of course, having a highly experienced injector is always, in Dr. Vuich’s opinion, even more, important than what product is in the syringe. The best results often require the use of more than one type of filler or procedure. 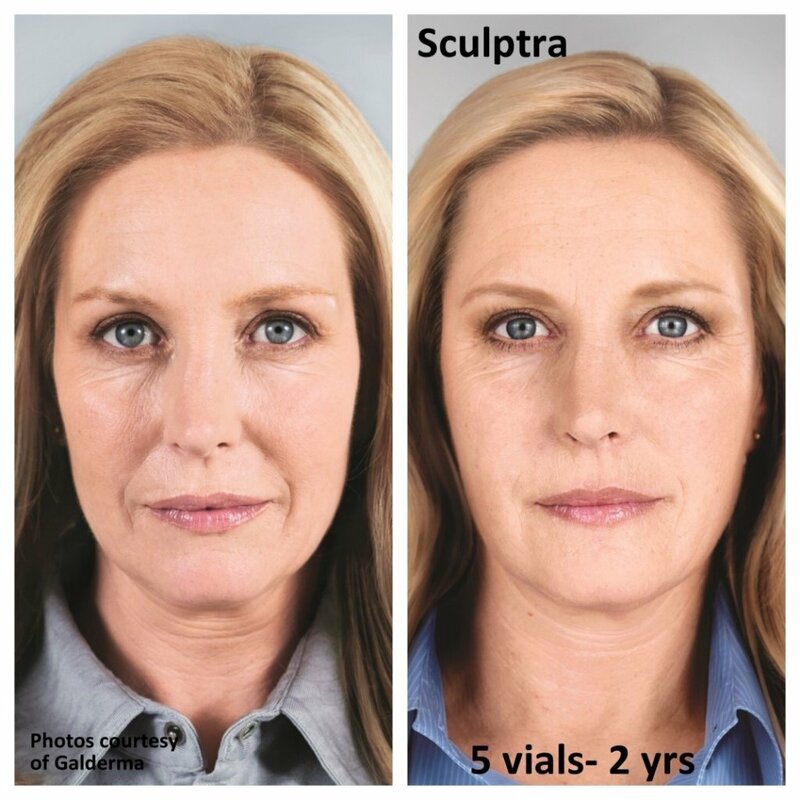 Where Sculptra® will shine is adding long lasting (years) volume to the temples, the cheeks, and the jawline. It can also be used in conjunction with other fillers, with Silhouette InstaLift sutures, with PDO smoothing threads, and even with other procedures such as laser and radiofrequency for skin resurfacing or tightening. During your personalized consultation, Dr. Vuich will help you understand what your treatment plan will entail. The recommended number of vials needed to address your concerns depends on how many areas require treatment and the degree of volume loss. A client who is 30 to 40 years old may achieve desired results with one vial per session. Over the age of 40, it is more likely that two vials per session will be required for full volume restoration. A Sculptra® treatment is relatively simple, and not unlike any other injectable filler treatment. Areas to be injected will be marked, and topical and injectable lidocaine will be used to increase comfort. Once the Sculptra® is placed, the areas will be massaged to help ensure even distribution of particles. You will then be asked to massage the area of injection for five minutes, five times a day for five days. As with any facial injection, there can be bruising, but it is usually minimal. You’ll be able to continue with your regular day-to-day activities right after the procedure. The results from Sculptra® develop gradually. Initially, you will see added volume due to the sterile water the product is reconstituted with. This water will be absorbed by your body quickly, leaving only the collagen stimulating particles in place. Two sessions of Sculptra® are generally required, with results evaluated at three to six months after the second session. Visible results may start to be seen a few weeks after the first session, but more dramatic changes follow the second session. The areas around the mouth and the eyes are not to be injected with Sculptra® due to the way the circular muscles around these areas contract, which is like the motion of a camera lens. 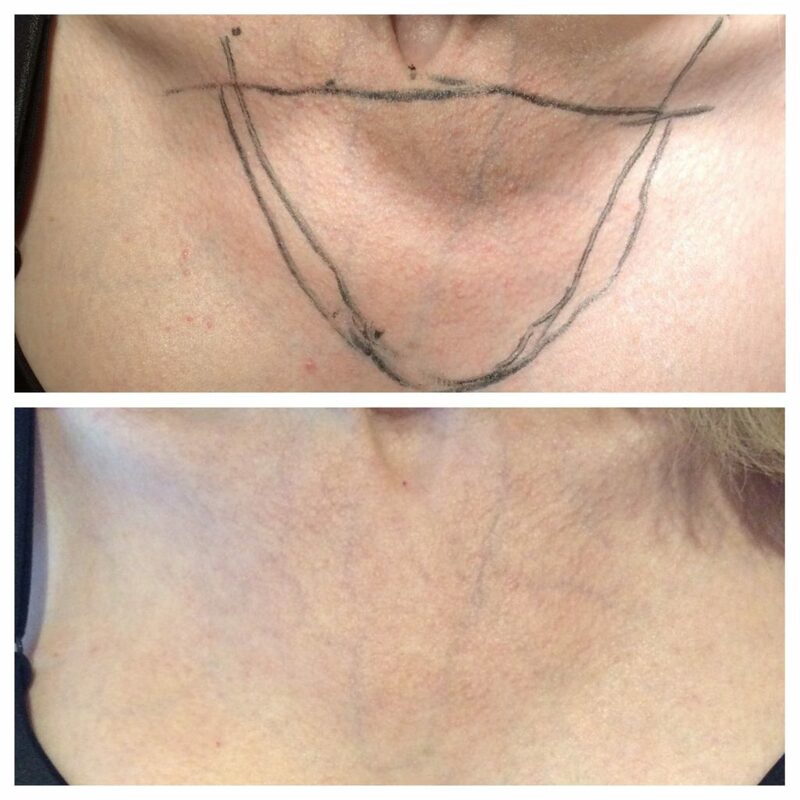 This muscle movement can result in an uneven distribution of Sculptra® particles, leading to a higher risk of nodules or bumps because there is too much collagen being created in one area. 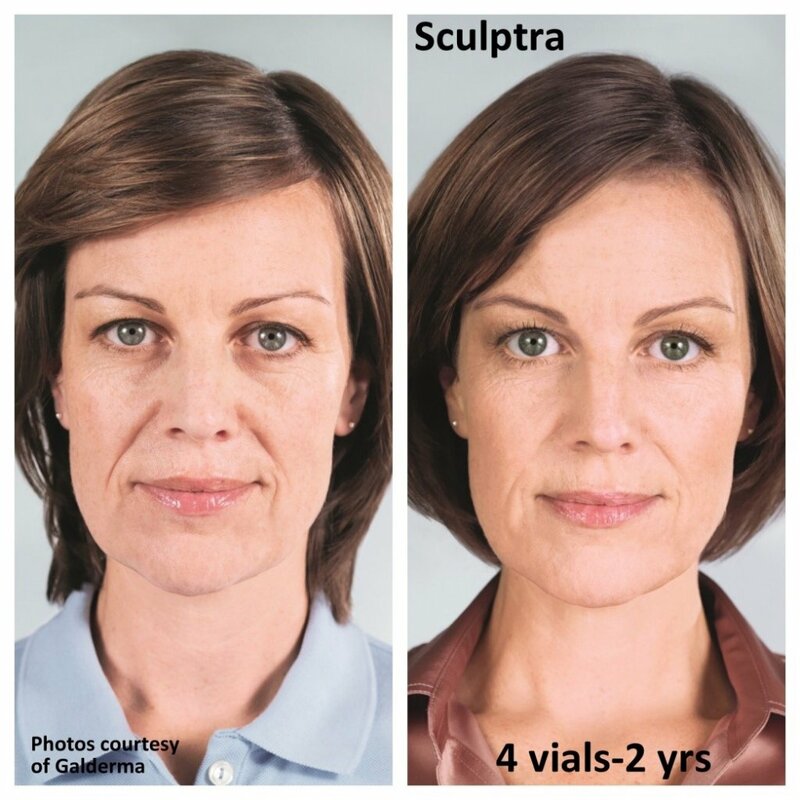 How long will Sculptra® last? The Sculptra® particles will very gradually disappear, but the collagen produced could last for five or more years. Once the desired correction is achieved, most clients have a maintenance session (one to two vials) about every two years to replace the collagen that may have been lost due to aging in that period. Remember that we lose collagen as part of the natural aging process; there’s no way to stop that! A typical Sculptra® injection protocol would be as follows: two vials used during the first session, followed by two vials in your second treatment session, which is four to six weeks after your initial visit. A third session with the application of one last vial may be needed for those with advanced age-related cosmetic concerns. Is Sculptra® safe, and what are the associated side effects? Sculptra® has been used in Europe since 1999 and was FDA approved for use in the US in 2009. In the early days, Dr. Lisa Vuich avoided bringing it in to Renew because it had a reputation for being difficult to work with, and there were reports of “bumps” or “nodules,” though these were mostly invisible and did gradually go away. Since then, the protocol for preparing Sculptra® for injection has changed, leading to a treatment profile no different than that seen with temporary fillers that are more temporary, in comparison.